FEMA To End Food And Water Aid For Puerto Rico : The Two-Way The Federal Emergency Management Agency has delivered millions of meals and gallons of water since Hurricane Maria devastated the island. Four months later, it says that help is no longer needed. 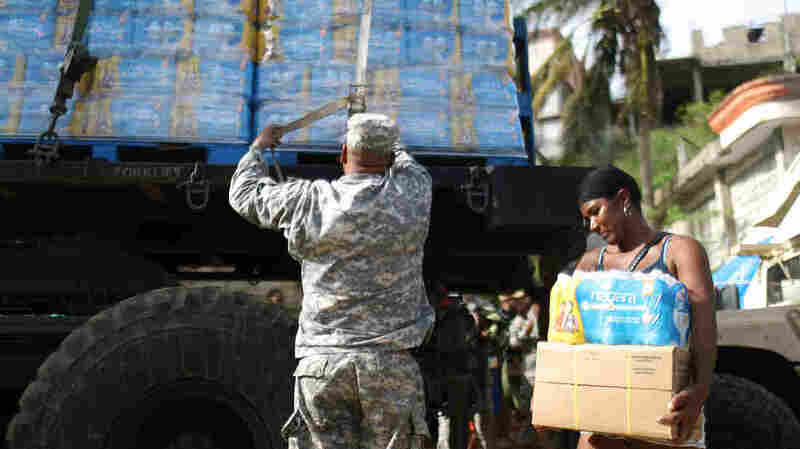 A U.S. Army soldier unloads a shipment of water provided by FEMA as a resident walks past in San Isidro, Puerto Rico. Eventually, towns and villages dug themselves out, but lacking electricity and in many cases running water, their need for emergency food and water persisted. So FEMA has continued providing it, dispensing enormous quantities to the island's 78 mayors, whose staffs have in turn set up local distributions or gone door to door to deliver the aid. On Wednesday, however, that aid will come to an end. In a sign that FEMA believes the immediate humanitarian emergency has subsided, on Jan. 31 it will, in its own words, "officially shut off" the mission it says has provided more than 30 million gallons of potable water and nearly 60 million meals across the island in the four months since the hurricane. The agency will turn its remaining food and water supplies over to the Puerto Rican government to finish distributing. Some on the island believe it's too soon to end these deliveries given that a third of residents still lack electricity and, in some places, running water, but FEMA says its internal analytics suggest only about 1 percent of islanders still need emergency food and water. The agency believes that is a small enough number for the Puerto Rican government and nonprofit groups to handle. "The reality is that we just need to look around. Supermarkets are open, and things are going back to normal," said Alejandro De La Campa, FEMA's director in Puerto Rico. The decision to end the delivery of aid is part of the agency's broader plan to transition away from the emergency response phase of its work on the island. In the weeks and months to come, the focus will be longer-term recovery. De La Campa said that includes finding ways to jumpstart the island's troubled economy. "If we're giving free water and food, that means that families are not going to supermarkets to buy," De La Campa said. "It is affecting the economy of Puerto Rico. So we need to create a balance. With the financial assistance we're providing to families and the municipalities, they're able to go back to the normal economy." To date, FEMA has approved more than $500 million in Maria-related public assistance, though it's unclear how much of that is slated for local government and nonprofit groups versus direct aid for individuals. The agency has also disbursed an additional $3.2 million in unemployment aid to people whose jobs were affected by the storm. But some say Puerto Ricans are not all ready to resume with their normal, pre-hurricane lives. In Morovis, a municipality located in the island's lush, mountainous interior, Mayor Carmen Maldonado said that about 10,000 of her 30,000 residents are still receiving FEMA's food and water rations. "There are some municipalities that may not need the help anymore, because they've got nearly 100 percent of their energy and water back," she said. "Ours is not so lucky." While the government reports that island-wide, nearly a third of Puerto Rican customers still lack electricity, Maldonado estimated that in her municipality that figure is more like 80 percent. She said that has forced families to shift their spending priorities in ways that have made FEMA's food and water aid a critical lifeline and the expectation that her residents simply resume their normal shopping routines impracticable. "In municipalities like this one, where families are going out to work just to buy gas to run a generator, it becomes very hard," she said, "because money they would use to buy food they're instead using to buy fuel." The median household income in Morovis is less than $18,000 and 51 percent of its residents live below the poverty line, according to the U.S. Census Bureau. So not even everyone can afford a generator, Maldonado said, given the hundreds of dollars it costs to buy one and the $25 to $40 worth of fuel a small one can consume in a single day. Families that can't afford them face a more basic problem: they can't plug in a refrigerator, meaning almost daily trips to the grocery store to avoid spoiled food, an unrealistic expectation in this municipality where some of the narrow, winding mountain roads still bear hurricane damage, requiring some residents to take detours of an hour or more. "This is all something that FEMA should contemplate before eliminating its delivery of these supplies," the mayor said. Maldonado said she was also disheartened by the federal agency's plan to transfer its remaining food and water supplies and responsibility for distributing them to its Puerto Rican counterpart, the Puerto Rico Emergency Management Agency, or PREMA. To date, Maldonado said, she has not gotten any information from PREMA on how to continue receiving food and water rations for her town after the agency assumes responsibility for distributing them on Jan. 31. The mayor said that she did not expect PREMA to distribute the goods fairly or effectively. A spokeswoman for PREMA, Beatriz Diaz, acknowledged receiving NPR's emailed questions regarding the agency's plan for distributing the food and water supplies, but did not provide answers to those questions despite multiple requests over more than a week. In an email, FEMA spokeswoman Delyris Aquino-Santiago said the federal agency had "provided guidance to PREMA and developed a contingency plan to support any unmet needs." But she also said that FEMA could not control how the local agency distributes those goods once FEMA turns them over on Jan. 31. In addition to the supplies it is giving to the Puerto Rican government, FEMA will also be providing food and water supplies to several nonprofits, including the Red Cross and the Salvation Army, Aquino-Santiago said. In the town of Morovis, teams of municipal workers still fan out to its hardest-to-reach communities to deliver the packages of food and cases of bottled water that they've been getting from FEMA every couple of days. On a recent day, one of these teams visited a high-up mountain community called Barrio Pasto. Getting there used to mean crossing a river by bridge. But the hurricane destroyed the bridge, so crossing now means driving carefully over a partially submerged slap of concrete that is safe only when it isn't raining. Among the recipients of a case of water and a package containing crackers and canned food on this day was Carmen Maria Quiñones Figueroa, a widow whose voice betrays her ever-mounting frustration over entering her fifth month without electricity. Nonetheless, she said her greatest trouble was not having running water. "I haven't had enough water," she said, adding that the collapsed bridge made getting to town to buy it difficult. Instead, she relies on what her children bring when they visit and the cases that have come from FEMA. Mayor Maldonado said that she'll continue distributing the aid to her residents as long as she keeps receiving it. And when she stops receiving it, she said she'll have to find another way. "That's been our policy since day one," she said, "Not to leave anyone without food or water."